วันพฤหัสบดีที่ 29 มกราคม 2015 เวลา 05:36 น. Once there was a woman named Kisagotami. Kisa Gotami lived in Savatthi. She was known as Kisa Gotami because of her slim body. She married a rich young man and a son was born to them. The son died when he was a toddler and Kisa Gotami was stricken with grief. She was so stricken with grief that she roamed the streets carrying the dead body and asking for help to bring her son back to life. The villagers all saw that the son was already dead and there was nothing that could be done. They advised her to accept his death and make arrangements for the funeral. In great grief, she fell upon her knees and clutched her son’s body close to her body. She kept uttering for her son to wake up. A village elder took pity on her and suggested to her to consult the Buddha. “Kisa Gotami. We cannot help you. But you should go to the Buddha. Maybe he can bring your son back to life!” Kisa Gotami was extremely excited upon hearing the elder’s words. 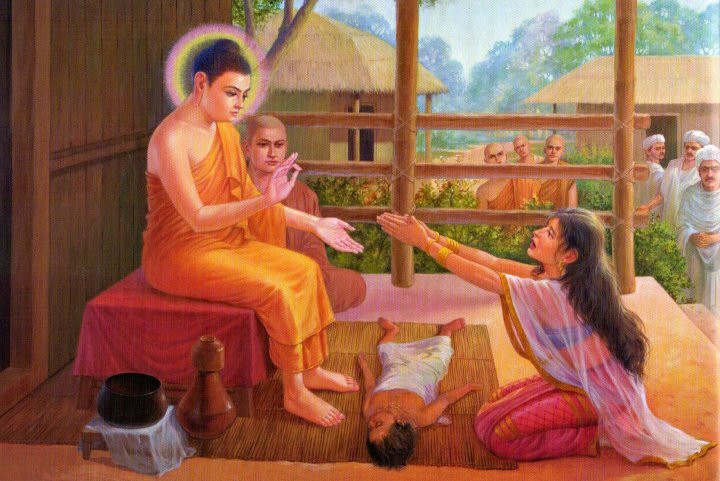 She immediately went to the Buddha’s residence and pleaded for him to bring her son back to life. Later, she was awakened and entered the first stage of Arahantship. Eventually, she became an Arahant ( One Who is worthy, anyone who has reached the ultimate state of Nibbana). Reflecting on the formula of life: even when she does not see the "a dead person" she should constantly reflect according to the five subjects that all people, male or female, lay followers or monastics, should constantly bear in mind. 1. We are subject to aging and cannot escape it. 2. we are subject to pain and illness and cannot escape them. 3. we are subject to death and cannot escape it. 4. we must inevitably be separated from all people and things that we love. 5. we have kamma as our own; whatever deeds we do, be they good or evil, of those we will surely be the heirs. Regularly reflecting in this way helps to prevent infatuation with youth, possessions and life, alleviating heedlessness and attachment, preventing evil actions and inspiring us to quickly work for goodness and benefit. you wiⅼl absolutely obtain nice experience. Ganhar Dinheiro OnLine e Sobreviver de Net é Possivel.